Middleweight Anthony Ogogo has promised to treat every fight like the Olympic final in his quest to win boxing gold for Britain at London 2012. The 23-year-old is one of Team GB's brightest hopes for ring success. "My next fight will be at the Olympic Games and that's going to be my Olympic final," he told BBC Radio Suffolk. "If I win that, the next one will be my Olympic final and so on until, touch wood, I get to that final - and that's everything I ever dreamed of." The Lowestoft fighter, silver medallist at the 2010 Commonwealth Games, secured his place in the squad for London by reaching the final of the European qualifying event in Turkey in April. And as the start of the Olympics comes ever nearer, Ogogo is ready to push himself to the limit to ensure he peaks at the right time. He said: "It's just manic from here on in. I think in the whole of July, I get to wake up in my own bed three days out of the whole month. "I'm here, there and everywhere training hard, but it'll all be worth it, I hope." The GB boxing squad will start the final weeks of preparation at a training camp in central France. "It's like a ghost town. There's no-one about and when we go out for a little walk in the evening, people close their blinds but you can see their eyes peering out," revealed Ogogo. "It's like a weird horror film but it's great because it's really secluded. There's nothing to do, but the facilities are brilliant and that's probably a good thing because you're only ever focusing on the one goal." 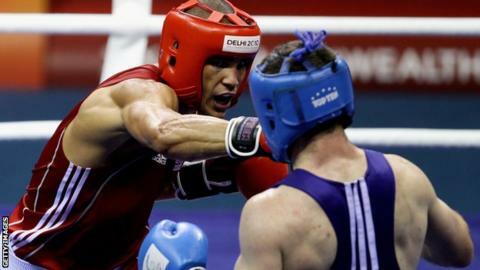 The Olympic tournament will take place at the Excel Arena and Ogogo is hoping for plenty of noisy support. "There's going to be 10,000 Brits there, and I can't wait to land those first clean blows and hear the roar of the crowd cheering me on. That's going to give me a massive buzz," he added. "When you go away to all these obscure places, it's either dead because there's no local boxer fighting or you're boxing against the local favourite and there's 10,000 people against you, so it's going to be so nice hearing all these people cheering when I land a punch, instead of when I take a punch. It's going to be great."